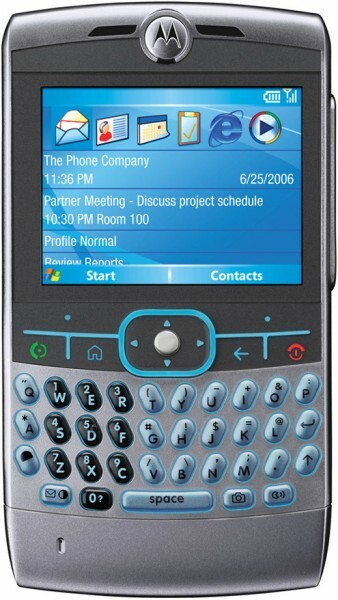 Today, Motorola announced the Motorola Q, a PDA Smartphone to compete with the Palm Treo and RIM Blackberry. The phone is powered by Windows Mobile 5.0 and supports the high-speed EV-DO network. The phone will be available starting next week (May 31, 2006) through Verizon Wireless. The Moto Q also includes a full QWERTY keyboard, Bluetooth, 1 mega pixel camera, miniSD expansion slot, and speakerphone. This phone will be especially useful for people that exchange many emails continuously since it supports synchronizing up to 8 Microsoft Outlook Accounts at once. The phone is quite expensive, and will run you $199.99 even after signing up to Verizon’s Voice/Data Plan and signing a 2-year contract. Although Motorola didn’t state when they would release this phone for other carriers, they probably will do so soon. This phone has not been officaly reviewed by anyone at this time, but the specs speak for themselves. The phone seems to be promising, however this such as the short 4-hour talk time may just not cut it for everyone. Size is also great–much better than treo–finally a smart phone that can fit in your pocket without busting your pant seams. Anyway, 4 hour talk time is pretty good–compare with 3 hours for my phone the A900—considering its breadth of features and power. Would you have to add the data plan to get this phone? I’m not at a point that I need the data plan (@$60 per month) but would love to own the Q because of it’s QWERTY keyboard, large display. yes i want that cellphone beacuse i am deaf use that cellphone . i want it!